I am your classic Uni Student that has moved to a bigger city to discover more of what's out there and to share! It's that time of the year again of Australia's favourite and biggest music festival! Travelling all around Australia in the summer and hitting Melbourne on Australia Day the 26th of January, what a perfect way to celebrate the day off! Tickets out on sale at 9 pm Thursday 19th of July. For $165, you can experience some of the biggest bands in the world, including headliners The Killers, Red Hot Chilli Peppers, Yeah Yeah Yeahs, Vampire Weekend plus many more (see below). 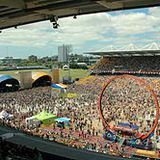 Taking place at the Flemington Racecourse, this year's festival has already started off smoother than last year's kafuffle leaving ticket goers speculating whether BDO will return to its ever reliable and quality form. With mistakes learnt, and fittingly so as the festival turns 21, BDO has a new partnership with C3, responsible for giving the US Lollapalooza and Austin City Limits Music Festival every year. The festival will sure to be a big hit so get your tickets fast. The Line Up also includes, The Bloody Beetroots, Animal Collective, Band Of Horses, Kaskade, B.o.B, Sleigh Bells, Foals, Death Grips, Alabama Shakes, 360, Crystal Castles, Pretty Lights, OFF!, Grinspoon, Against Me!, Gary Clark Jr, Nicky Romero, Morgan Page, Logo, Every Time I Die, Delta Spirit, Childish Gambino, Me, Hunting Grounds, Jeff The Brotherhood, Adventure Club, Jagwar Ma, House vs Hurricane, Avalanche City, Toucan, Helena, Nina Las Vegas and Sampology. Why? Australia's favourite and biggest music festival.